Egbert van Heemskerk was born in Haarlem where he was taught by Pieter de Grebber and Jan Miense Molenaer. His work was also strongly influenced by Adriaen Brouwer, and he imitates his style by his use of strong local colour against a more monotone background. His best pictures are frequently attributed to Brouwer. 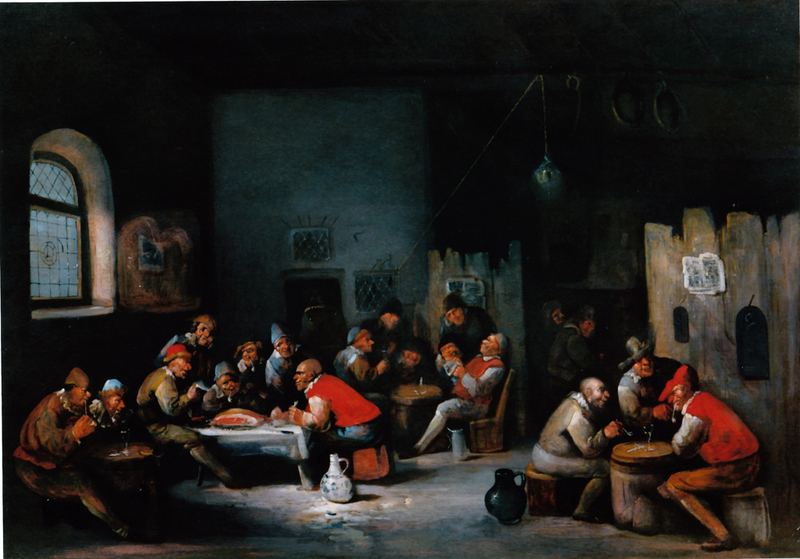 His moved to England after the restoration of the monarchy, and was the first painter in England to produce “populist” paintings of taverns and other scenes of low-life. He also painted scenes of Quaker meetings, election and other crown scenes populated with numerous figures, often grotesque to the point of caricature. He occasionally painted portraits in a freely-brushed style which has echoes of Frans Hals, a portrait painter with whom he would have been acquainted from his days in Haarlem. Heemskerk seems to have spent the rest of his days in London, sharing a studio with his like-named son, whose style continued that of his father. Both were prolific, and their paintings are to be found in many old English collections. He died in London, in 1704.